We often crave healthy vegetables for dinner, and a power bowl is a great variation to a basic salad with the additions of whole grains and proteins. 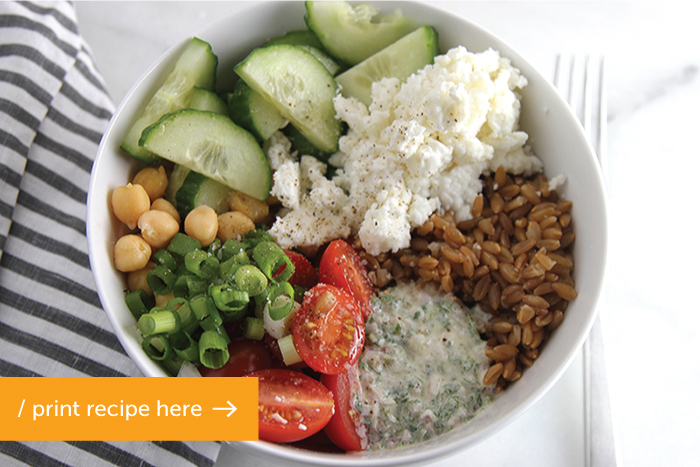 Power bowls need a bold dressing, and the creamy mint dressing in this power bowl composition passes the test! Feel free to riff on this basic profile by adding other ingredients such as Kalamata olives, lettuce, red onion, or green pepper. 1. Cook the farro by rinsing 1-2 times in water. First, rinse farro 1-2 times with water. In a saucepan, bring the farro, 2 cups of water, and a pinch of salt to a boil. 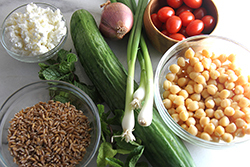 (Always cook farro using a ratio of 1 part farro to 2 parts water or liquid.) Turn to low, cover and simmer for about 40 minutes, or until individual grains are tender yet toothsome. Check periodically to ensure that enough water is present and that the grain is not scorching. 2. 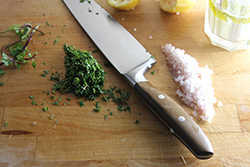 Prep the cucumbers, tomatoes, and scallions by slicing. 3. Rinse and drain the chickpeas. Crumble the feta cheese. 4. 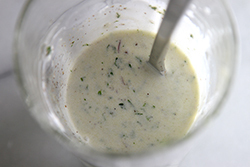 Whisk all the dressing ingredients together until well combined.